What Influenced by Decision to Move to Groote Eylandt and Start a Blog? 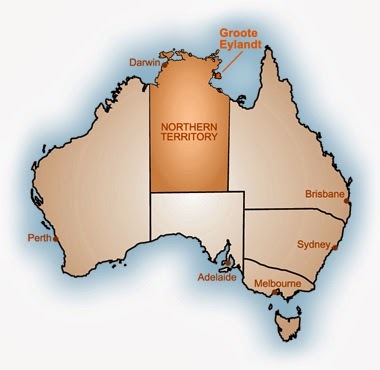 I am writing this blog to share, teach and document my time living and working in a remote location in the Northern Territory, Australia. Please check back regularly to see photos and read about my experiences and thoughts of living a different sort of life within Australia, my homeland; yet largely unfamiliar to me along with the majority of those inhabiting it. I am venturing across the western side of the treacherous Gulf of Carpentaria to reach a large island called Groote Eylandt. Pronounced ‘Groot Island’. I however, have told family and friends that I am off to ‘Grooty’ Island, none of which were able to correct my mispronunciation due to the fact they’d never heard of it in their lives. TELL ME MORE ABOUT THIS ‘GROOTY’ ISLAND! OK sure. Its population is approximately 1400; one third of which are Indigenous. The traditional owners of the land are Warnindilyakwa (more commonly referred to as Anindilyakwa). There are three Indigenous communities living on the island. They are Angurugu, Umbakumba and Milyakburra. The other two thirds of the population are made up of miners and folk like me who want to experience very remote living. The mining operation is run by a company called GEMCO, which is owned by BHP Billiton. They are mining for a resource called manganese. Miners come from all over the world to work here, resulting in a highly multicultural community. The school I am teaching at is called Alyangula Area School. Its students range from kindergarten to Year 12. The school is owned by GEMCO and is predominately made up of children whose parents work to assist the running of the mines in some capacity. There is a mix of Indigenous students, permanent Australian residents as well as Internationals. I will be teaching in a grade 3 classroom for the remainder of 2014. WHAT POSSESSED YOU TO DO THIS? Indigenous culture is an important part of Australia’s history. During my schooling in the 90s, educating my generation (and earlier) about Indigenous culture was not a priority within the curriculum. Therefore, I have grown up largely unaware of the Indigenous peoples’ existence. It seems unheard of now, largely due to the amount of media attention our Indigenous population acquire (largely unwelcomed), but I feel as though there is a large gap in my knowledge regarding my own country’s history and becoming. Children seem so fascinated by America’s culture, they seem to know more about its history and politics than they do their own. Perhaps this is due to the fact Australia’s people come from all over the world, with such diverse backgrounds, making it difficult for some to know which country’s history they stem from. Coming back to why I’ve decided to move to the NT, there are two main reasons. One is to satisfy my curiosity of what its like to live in a remote location and live amongst Indigenous people. To learn more about their culture and their way of life. The second relates to my profession as an educator. Having been required to teach a term-long unit on Indigenous culture last year, I realised I knew very little about it. As usual, I headed straight for trusty Google to equip me with the knowledge I required to teach my students. However, I was shocked to find so few online resources that represented our Indigenous culture from the positive perspective I wanted to share with my students. To avoid rambling on for too long (if I haven’t already), the short answer is that I want my students to learn everything about Indigenous culture that I did not. I want them to embrace the creative nature of the Indigenous people and recognise their many contributions and vast knowledge regarding our land, our home. Thank-you for taking the time to read my first blog. I’m very excited to have the opportunity to share my experiences and hopefully we can learn along side one another to help educate the future generation. Wow you must be an amazing angler, that is one massive Goldie!